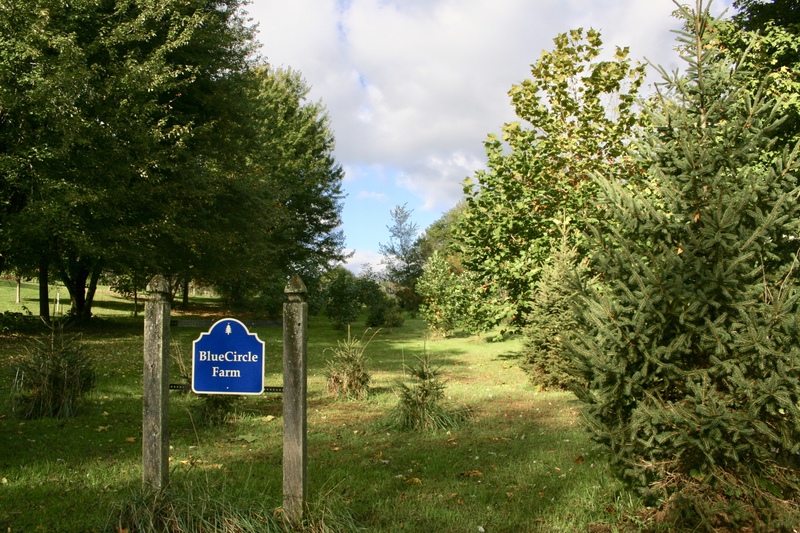 What’s growing in the Bluecircle? The skies cleared last night to celebrate the lunar eclipse and make way for near-record cold. 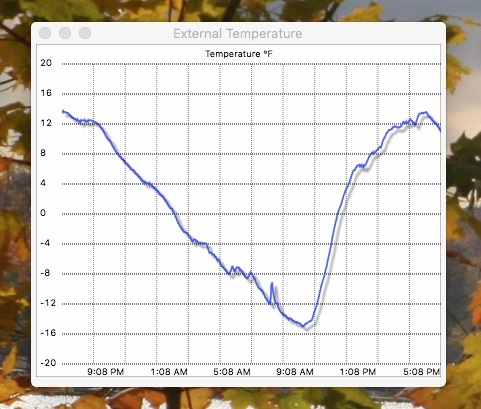 The farm’s weather station at “East Paw Paw Lake” recorded 15 below after a windless night. A single woodpecker broke the wintery silence of the morning. 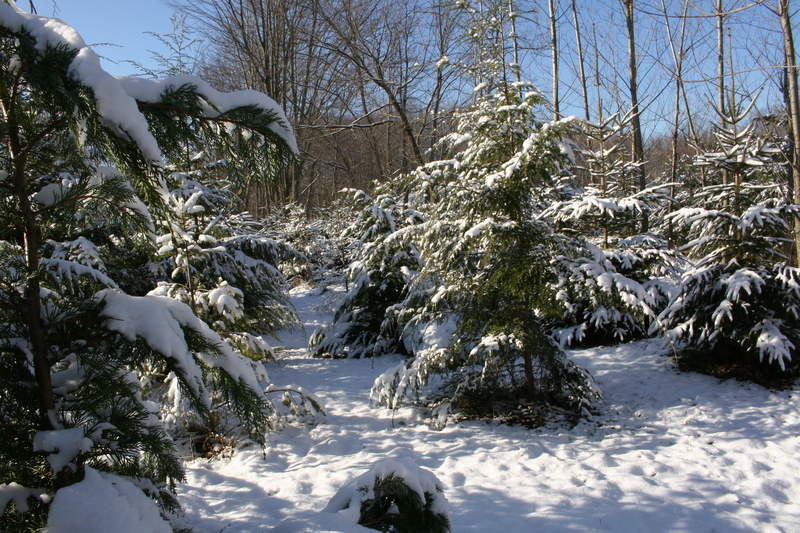 At year’s end a shiny windless day invited neighbors to track into the new snow. Green patches marked where a pair of does slept in the storm. The dirt in their tracks was muddy, warmed by recent rains and a little sunshine. Only distant traffic, the occasional crack of hunter’s practice rounds and the camera shutter break the quiet. 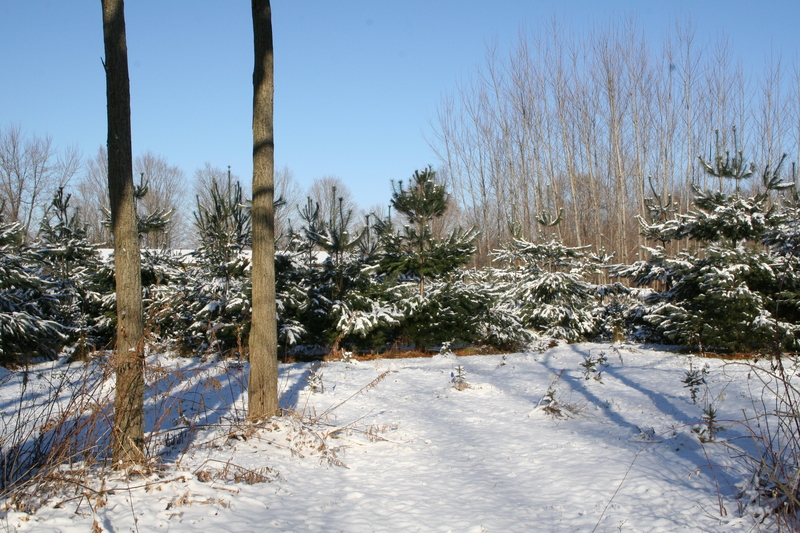 Even light wind today would have relieved the pines of their easy burden of snow. A few have branches crippled by the heavy ice and snow of a recent storm. 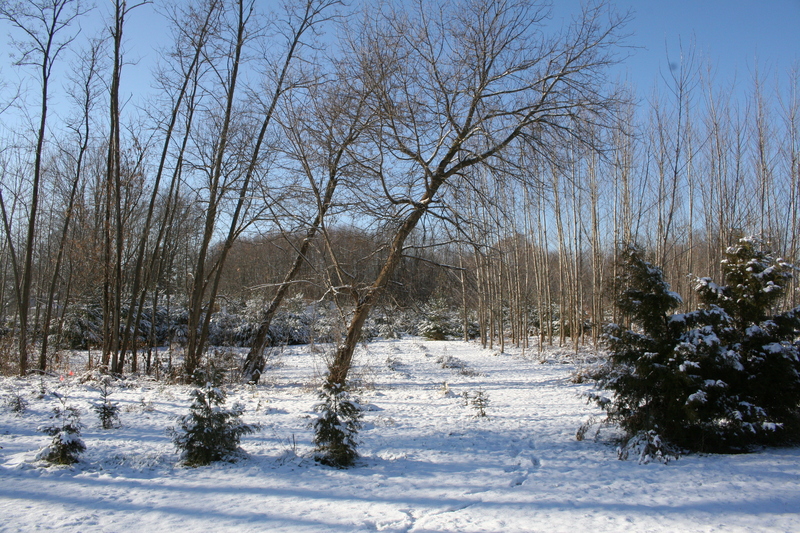 The fallen trunks and limbs in the adjacent Woodland Conservancy now have been cleared from all but one of its trails. One day of this year remains and rain is again in the forecast. It’s a good time for indoor projects or just relaxing. The first of the seed and nursery catalogs has reached the reading table but for now the trees and farm will just rest. He was an old man who raked alone on his suburban lawn and he had gone all afternoon now without stopping for coffee. His grass was closely-trimmed and green in Detroit’s November, the mowing over for another year. Two dozen metal tines scraped across his sidewalk to bags nearly full with leaves all waiting at the curb for transport. Fifty years ago diesel tractors stole the Sterling farm’s topsoil to carve these streets and basements. New owners rolled out thin sod, flooded maple saplings between the curbs and driveways with too much water and began the litany of weed-and-feed, trimming and raking that ensued. He was there in the first years when toddlers dotted every yard and the parish school blossomed. While neighbors and their children moved north or west and new ones came his family was rooted here. He remained after he sold his store and stepped away from its drums and guitars. Empty bedrooms and now nearly-naked branches marked the turning of the years. 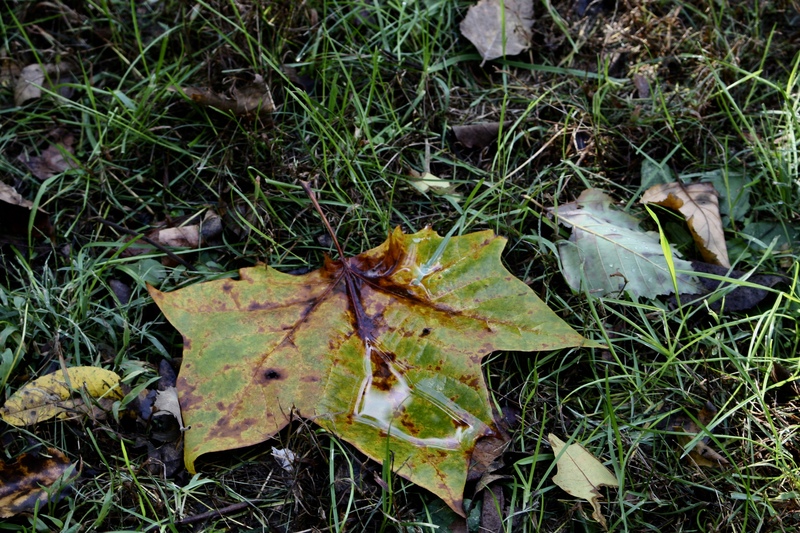 Alone each brown wet or crisp red leaf held its story until, when swept together, its voice disappeared in the rasp of the pile being pulled across the lawn. The raker’s shoulders and back were tired and showed his age. Today he did not much care for what the leaves could tell of his neighborhood. There were no majestic trees here like sycamores with giant leaves larger-than-life even as they fell. Tall oaks would have held fast most of their leaves until the first snowfall or even later. Like its people it was a subdivision of maples; soft or hard, crimson, Norway or silver and all-American. A gust freed more pilgrims to reach ground in the afternoon sun, their labors done. He stood his rake in the back corner of the shed knowing that tonight a wet snow would blanket them. Then it would be time to find a shovel but now he would dream of catching a fine fish. The Bluecircle has reached that age where it’s no longer a baby. The last two years have been free of drought and wind damage, so some pines, oaks and maples are reaching their “teens” in height while the poplars tower far above. Tulip poplars that line the pathway from N. Watervliet Road will shade it in the next year or two. At the edges black walnut trees spread by busy squirrels are slowly overtaking wild sumac and briars. 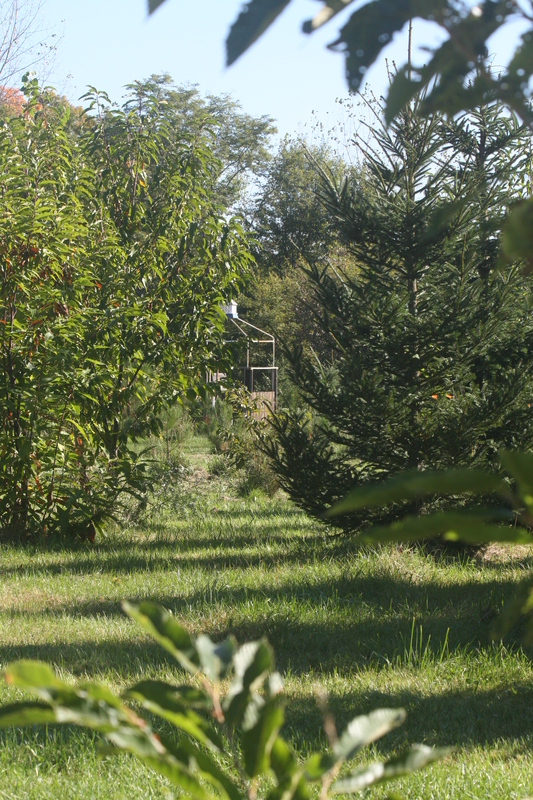 With nearly 50 walnut seedlings or 7-year trees in the farm plantings the ground will soon be thick with nuts. Red oaks produced a few dozen acorns this year, as did both the chestnuts and English walnuts. The mature white oaks had heavy loads of acorns and the local squirrel population is large, fat and fearless. Hickory seedlings were added this year to round out the nut menu for future wildlife. There are no picture of the BC apple orchard that has struggled. Of the original 9 seedlings only 7 are standing. Three of the founders lost their “appleness” grafts and survive only as rough peach rootstock so this year they were replaced with pot-raised transplants. The latest addition was a small bat house over the watchtower, a platform crafted from remnants of gazebos and old lake docks. A summer came and went after the last post here, fading like the sun over Lake Michigan in August. Soon the greens of the Bluecircle will evolve into their own annual sunset. For the most part these have been wet, hot months. 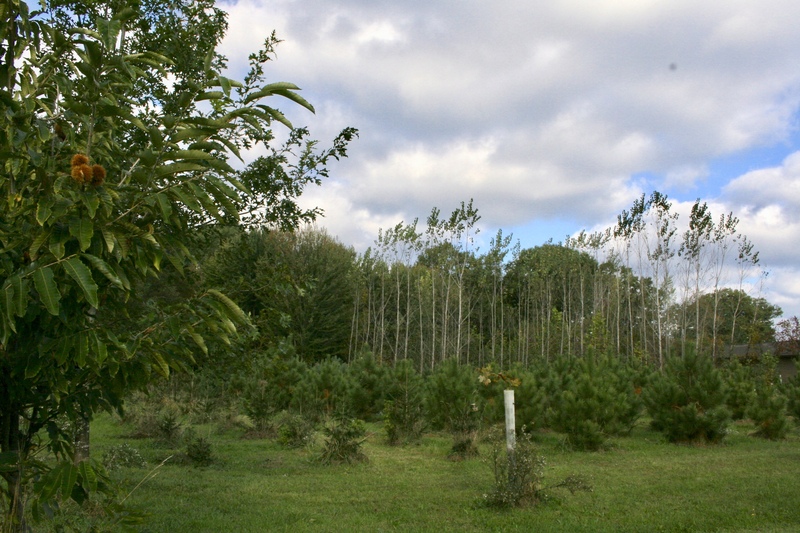 Groups of 25 new Norway spruce, sycamore and black walnut seedling have fared well and most twigs of sugar maple have also survived. Conditions were good for conifer growth so farm “anniversary” photographs a few weeks from now will show some rows of trees closed, their branches too dense for the lawn tractor to pass. This writer will not be sorry when “mow again” can be removed from the weekly agenda. This gallinipper (psorophora ciliata) was likely a product of the plentiful rains that frequently left standing water near the lake. Fortunately these extra-large mosquitos are not as common as the tiny pests that buzz at DEET and even follow you indoors. 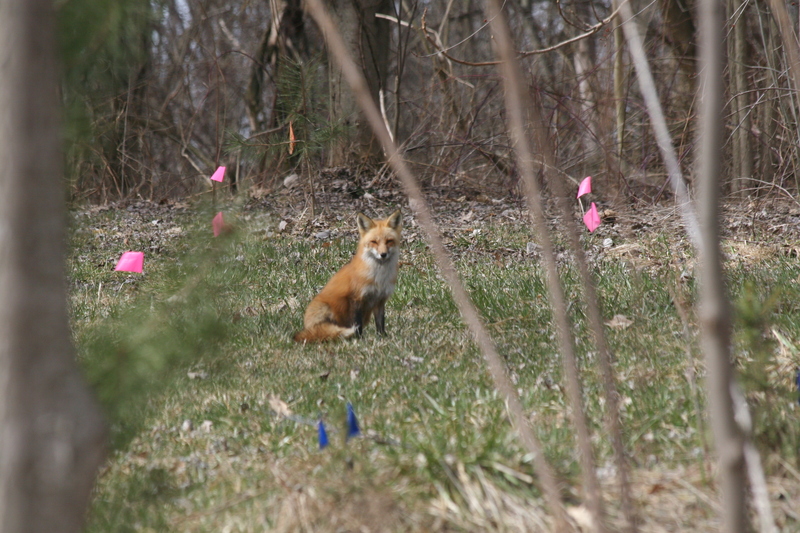 The bite of the first wood tick and a glimpse of new red fox kits were clear signs of Spring on the Bluecircle this week. Patches of fleshless groundhog fur and a fresh limb in the middle of the farm showed the young were being nourished by their ever-watchful mother. Few rabbits have survived the fox’s nightly inspection of the woods and hillsides. 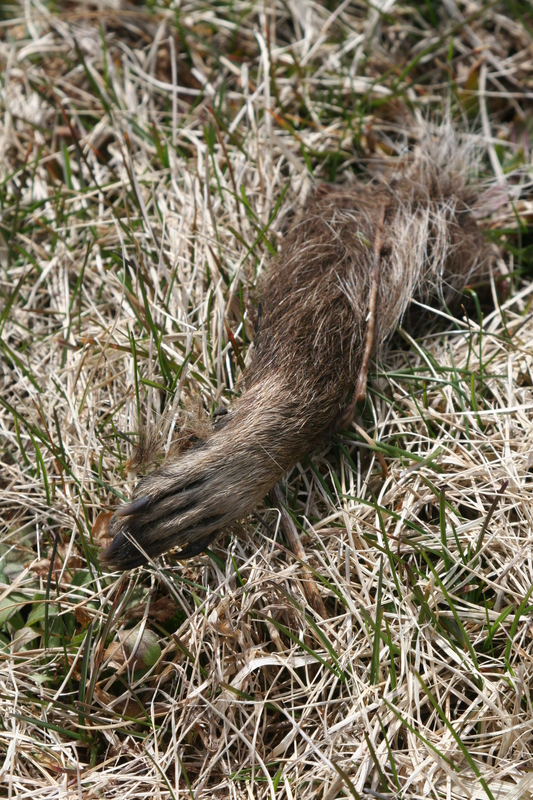 The groundhogs have not been spared but are not missed since their excavated mounds and burrow openings can sink an ankle or a wheel. Threads of green are restoring color to the field but for a few more weeks the dead grass and leaves will provide scant cover for our hungry mother’s prey. The calendar says Spring. Frosty ground that crunches underfoot and ice-glazed puddles argue otherwise, backed by a stiff north wind. Hat, coat and gloves are still required these March mornings, and even later unless you find shelter in the sun. Or better yet, in a warm porch or car. It’s the season of poplar cuttings, set indoors with one brown bud just above the potting soil. Fewer are needed now than in years past, but these rapid-growers tolerate Michigan clay and hot summer days better than any of the other plantings. Orders for a few dozen more walnut and norway spruce seedlings are placed; bright pink flags where they will be planted wave in the breeze. Tiny sugar maples and sycamores will fill gaps here and there in the existing pine and spruce plantings to provide eventual diversity. Neither grass nor weeds have broken the bonds of Winter. On the other hand, the 7 Bluecircle hens are laying eggs again. Their first hours in the run beyond their coop were filled with scratching, pecking and happy cackles. Paw Paw Lake was flooded and ice-free weeks ago but lake-effect snow squalls from the big lake have lingered. The afternoon sun dims and shines moonlike on the icy water, longing for April warmth.